Whether you’re a novice or an experienced freshwater fisherman, there’s “one” in the water waiting for you, no matter what time of year. The major species of freshwater fish caught at Highland Park Fish Camp are largemouth bass, bluegill and speckled perch. Largemouth bass bite year round. In the fall and winter months (September thru March) live bait is best and accounts for the most trophy fish. In the spring and summer months (April thru August) artificial baits prevail. The St. Johns River is still the best place in the world to catch a trophy largemouth bass, which Highland Park Fish Camp visitors access via the Norris Dead River. 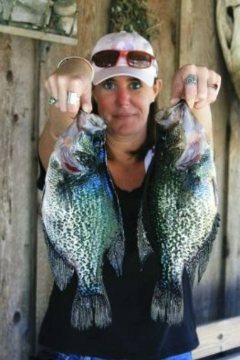 Crappie bite best in winter months and bluegill in summer months. We have a tackle shop, stocked with tackle and supplies. We offer rod and reel rentals and sell fishing licenses, hot and cold sandwiches, cold drinks, ice, gas, oil, and some marine supplies. We also offer a variety of live bait: wild shiners, domestic shiners, minnows, worms and crickets. At Highland Park Fish Camp, we have a large area to clean your catch and plenty of room to freeze and store your fish at no cost to you. We also have a Taxidermy service that can ship your trophy mount anywhere in the world. Be sure to see our 50 trophy mounts of fish and game in our "Fisherman's Den." Bass Masters Magazine Tips For the Pros - The heat is making the pros come up empty handed.